I produced this picture as part of my “Introduction to Free Machine Embroidery” weekend with Pauline Verrinder from Brickworks, Cambridge. I designed a heart shaped stamp using foam and cardboard and used fabric paint to stamp 9 hearts in turquoise on a calico background. Each heart was covered with an organza square before using different methods I had learnt during the weekend, to decorate each heart. These included adding small pieces of organza or metallic fabric to the heart and attaching it with machine stitching. I also used a range of threads on my machine including variegated thread, contrasting top and bottom threads, metallic or shimmering threads and the production of a cord which was then sewn in place. Under The Sea This picture was originally designed for my Australia wall hanging as part of a Mixed Media Textile course I attended. It contains a background produced by strip patchwork to which I added a range of sea creatures using Bondaweb. I then created corals using Free Machine Embroidery on water soluble fabric. I used a range of different coloured threads and included small fragments of material to produce interesting textures. Having dissolved the water soluble fabric I then laid and attached the corals over the background picture. On leaving Newcastle my friend Beck bought me this cross stitch kit to sew and remind me of my time spent there. 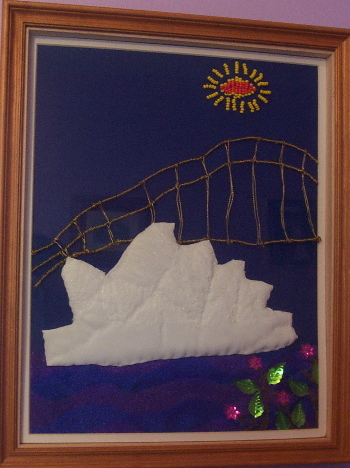 It depicts the Tyne Bridge with the Quayside in the background, I enjoy using cross stitch kits for cards and have made and sent many for a variety of occasions. I find cross stitch a relaxing stitch to do but think that it is important that the design is not restricted by the square nature of the stitch. Shepherd and Sheep Having done several smaller kits with both the simple long stitch and tent stitch I found this large German kit which incorporates many different tapestry stitches. Many of the stitches involved using canvas and a tapestry wool and different variations on a long stitch. The sheep were created using latch hook technique and the dense number of stitches taken to fill each sheep provides them with their interesting texture and colour mix. The picture size and variety of colour and stitches has made this a prominent focal point in our home. This picture was produced using a kit from Agneta Engman Designs, Cheshire. It introduced me to a stitch called Twisted Stitch using canvas and paterna yarn. It is based on tent stitch but produces a more interesting looking stitch. I was particularly drawn to the colour scheme and it was framed for a local Townswomen’s Guild competition where it gained a silver star. Patchwork provides many different techniques which can be used in a variety of combinations. I was introduced to patchwork by Kim Shaw during very enjoyable weekend courses at Belstead House near Ipswich, Suffolk. There are many patterns available in books and magazines and I have used both in some of the work I have done. I have also used appliqué of shapes that I have produced myself. I followed patterns for these animals using patchwork foundation piecing from a book by Margaret Rolfe. I decided to use vibrant colours and unconventional patterns on the animals to make them more memorable and believe that this creates a cheerful and interesting wall hanging. This cushion cover was created using patchwork, applique and machine embroidery techniques. It was created for a local Townswomen’s Guild competition in the open patchwork cushion category. I used a DVD of the Great Barrier Reef to provide the inspiration for the fish and corals. I used fabrics in a range of colours and textures and applied them to the background using Bondaweb. Free machine embroidery has been used to embellish many of the rocks and corals. This wall hanging was one third of a pattern in Patchwork and Quilting magazine. I worked on this during a Patchwork course at Belstead House, Ipswich with Kim Shaw. It took a whole weekend to produce this single panel due to the labour intensive satin stitching around every piece of the wall hanging followed by quilting in the ditch around each piece. I produced this factory as part of the display of Cherry Hinton WI in the Peterborough Show 2002. Our theme was Lancashire and I used a range of techniques to make this factory in the style of the artist LS Lowry. The roof was made of crazy patchwork and machine embroidery embellished strip patchwork. The figures on the green part of the building were made using gutta outlined silk painting and the others by free machine embroidery on water soluble fabric. The windows on the green part of the factory were stitched using an assortment of stitches.